ISIS invaded Aswad’s village Kocho on 10 August 2014. They militants insisted that all the Ezidis (Yazidis) in the village convert to Islam or die. 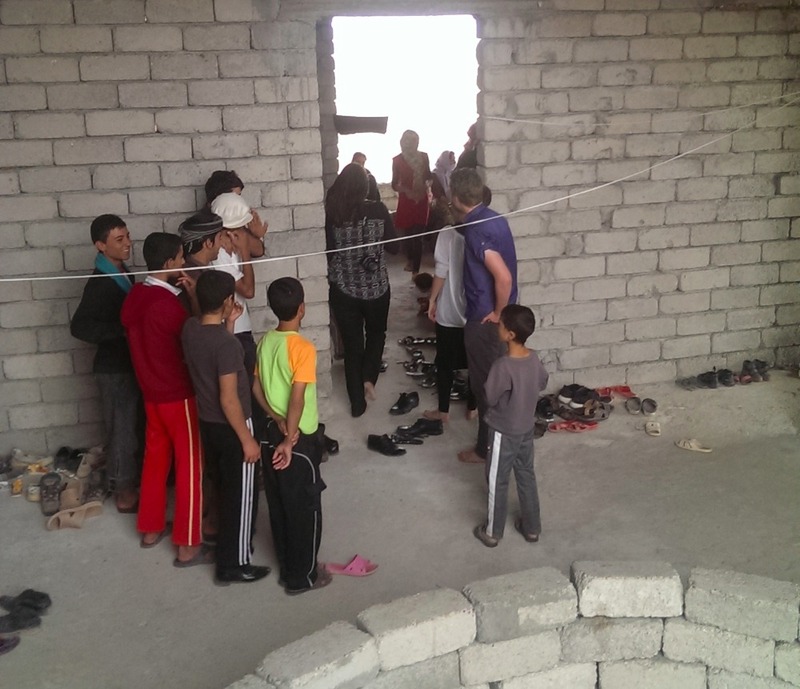 When they refused, ISIS gathered around a thousand people in the school. They took villagers’ phones, money, and jewelry. Then, ISIS took the men and drove them in three trucks several hundred meters from the main road. There, they knocked them to the ground and shot them with machine guns, and then shot them each in the head to make sure he was dead. When it was Aswad’s turn, the executioner heard planes approaching and ran away, leaving Aswad in agony, with four bullets in his pelvis and legs. The rest of the men died on the spot, except three men who ran away wounded, and who, as Aswad learned, ISIS later found and killed. Aswad, a man in his forties, believes that his inability to walk or run saved his life. Crawling in pain, hunger, and thirst, after about five hours, he reached the nearest village (around 2km away). Fearing ISIS’s revenge, the villagers threw Aswad out of the village on a blanket and abandoned him. However, in the darkness of the night, a teenager from the village came to him, brought him water, and let Aswad borrow his phone. Aswad called his friend who, with a much fear and hesitation, came to help him. His friend kept hiding him, as he lay delirious with a high fever, in poultry farms and in an abandoned house. Aswad's friend continued to hide him in poultry farms, switching locations every two days. Fifteen days after the surgery, he needed to visit a doctor again, because he had stitches left in his legs. While in the hospital, an air strike hit the building. Aswad's friend was injured in his leg, too. But his wound was not that serious, so he was able to take Aswad to Syria to have another operation. There, the doctors took out three out of four bullets and after three hours, they came back to Iraq. Aswad did not feel safe at his friend’s place at all. Additionally, the villagers insisted that Aswad leave the village, because the villagers were afraid for their own lives. After ten days of waiting and fear, at night, Aswad’s friend drove him to the checkpoint in Kirkuk and left him there, wishing him good luck. At the checkpoint, the guards did not believe that Aswad was a Kurd, because he resembled ISIS so much. Aswad showed them his ID stained with blood, and told them the spine-chilling story of the recent events. Finally, after what felt like a lifetime for him, he was in Kurdistan. His cousin picked him up from the checkpoint and took him to Baadre, where Christian Peacemaker Team members met him on 3 October on at the house of one of the Ezidi sheikhs, where Aswad temporarily lives. Now, Aswad needs to get better, but for that he needs another surgery, for which he does not have money. His health is very bad. His constant pain and trauma have resulted in lack of sleep for the past forty days. All the time, he sees the images of atrocity in his mind. ISIS killed his eighteen-year-old son, his brother, and his brother's son in front of his eyes. He was told that ISIS took his two teenage daughters as slaves to Syria. He worries about his wife and other eighteen members of his and his brother's family who might still be alive, but in ISIS hands. CPT learned from Aswad that no one from the Kurdistan Regional Government had come to visit him. After meeting Aswad, a CPT partner contacted the Ministry of Martyrs and Anfal Affairs and asked for an audience. On 12 October, the minister met Aswad in a very respectful manner and promised to help him. The Ministry paid the expenses of his travel and over night stay in Hawler (Erbil) and a visit with a doctor. The doctor assessed a surgery to be dangerous based on the location of the bullet but offered a follow up later. Aswad awaits a further fulfillment of the promise of support.